In collaboration with the CNES and NASA oceanographic projects (T/P and Jason), the OCA developed a verification site in Corsica since 1996 and LEGOS installed sites at Kerguelen island in 1993 for oceanic validation and at Lake Issykul and along the Amazon river for continental waters. More recently, new coastal sites in France (île d'Aix and Perthuis Charentais, Arcachon Bay, Gironde Estuary) have been developed to deal with the littoral context. 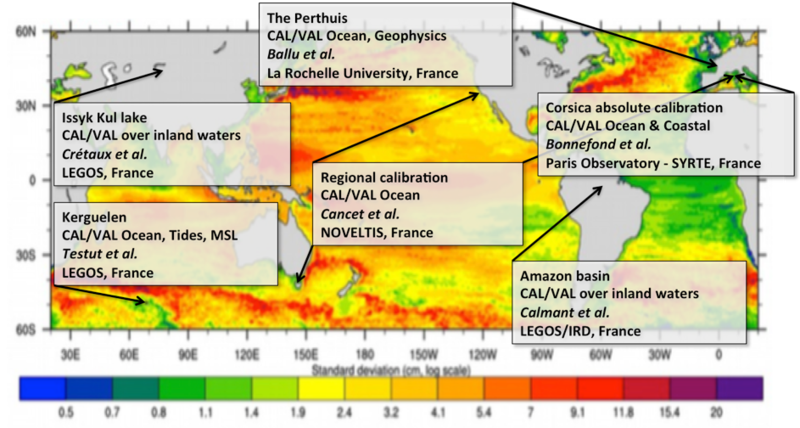 CALibration/VALidation embraces a wide variety of activities, ranging from the interpretation of information from internal-calibration modes of the sensors, the determination of the algorithm performing best in picking up the range in the radar echoes in various contexts, to validation of the fully corrected estimates of the heights, whether it is sea level or inland water stage using in situ data. Now, Corsica is, like the Harvest platform (NASA side), an operating calibration site able to support a continuous monitoring with a high level of accuracy: a 'point calibration' which yields instantaneous bias estimates with a 10-day repeatability of around 30 mm (standard deviation) and mean errors of 3-4 mm (standard error). The inland sites are also unique in the scientific community. They provided the only estimates of bias for non-oceanic retracking algorithms commonly used for continental waters or for ranges issued from ocean-like waveforms in a context of very low sea-state bias, as it is frequently encountered over lakes. In-situ calibration of altimetric height (SSH for ocean surfaces) is usually done at the vertical of a dedicated CAL/VAL site, by direct comparison of the altimetric data with in-situ data. This configuration leads to handle the differences compare to the altimetric measurement system at the global scale: the Geographically Correlated Errors at regional (orbit, sea state bias, atmospheric corrections…) and local scales (geodetic systematic errors, land contamination for the instruments, e.g. the radiometer, land contamination for the radar echoes, e.g. tracking/retracking concerns). We intend to continue and ensure the experiments already conducted through the FOAM project (2007-2011, 2012-2016 and 2017-2020), funded in the framework of the Jason mission (but includes a multi-mission approach), at various sites (Corsica, Kerguelen, île d'Aix, Perthuis Charentais, Arcachon Bay, Gironde Estuary, lakes and rivers…) where the local conditions are different from each others but where permanent instruments and infrastructures already exist and have to be reinforced. The FOAM project has been the place of a reflection about CAL/VAL methodologies and in particular about building dedicated instruments. This last point, which insures consistent procedures and equipment among all the team members is crucial for the CAL/VAL of SWOT if a large effort including several places far away one from the others in a very short time (during the fast sampling phase for instance) is expected. The different sites and approaches will be adapted to SWOT to insure calibration and validation over larger areas than single passes like for nadir altimetry. Consequently, the team members listed in this proposal are naturally involved in other proposals responding to the SWOT ROSES/TOSCA call that include a potential CAL/VAL activity. Details on the FOAM project can be found here. Figure 1. Locations and themes of the cal/val activities in the frame of FOAMS. Use or development of instruments to measure in situ water level. Two distinct methodologies exist for the measurement of the in situ Water Surface Height (WSH) at a comparison point that is subsequently used for comparison against the altimeter WSH (Bonnefond et al. 2011. The techniques and underlying algorithms are quite disparate depending on the particular application and will not be developed here. However, it must generally consider - either directly or indirectly - geophysical, oceanographic, river bed configuration and atmospheric phenomena that cause the variation in water level over time and space. Direct method: In this case, WSH is physically measured at an offshore comparison point using, for example, GNSS-based systems or offshore instrumentation, as it is the case for the Harvest platform (Haines et al. 2003). Indirect method: In this case, the WSH measurement involves the observation of water level away from the comparison point, typically using a tide gauge at nearby location. The offshore altimetric WSH is then "transferred" or "extrapolated" at the location of the in situ instrument through the use of precise models. Figure 2. Snap view of the sites. For all the sites, satellites tracks are: T/P-Jason (purple), SARAL/AltiKa-Envisat-ERS (yellow), Sentinel-3A (red), Sentinel-3B (brown) and SWOT (light blue). (a: Corsica) Planned sea surface mapping for SWOT (white line, every ~1 km) with the swaths (blue shaded areas limited by the green lines) of the descending track #211 (left) and of the ascending track #254 (right). The black lines on the colored maps are the tracks followed in 1999 and 2005 by the Catamaran-GPS to map the sea surface (Bonnefond et al. 2003). (b: Kerguelen) Permanent Tide Gauge since 1993 at 20 Km from cal/val site, deployment of 3 moorings since 2009 under track #179 , GPS buoy session at cal/val site (instrumental development with DT/INSU, development of High Resolution barotropic model for dealiasing. (c: Perthuis) Redundant, quality and reliable data both on the atmosphere through GPS and meteorological data and on the sea level, regular GPS buoy sessions beneath satellite tracks for absolute calibration purpose, investigate the coastal contamination effects on the range retracking and on the wet tropospheric correction, the Cordouan lighthouse will also host the GNSS-R system (reflectometry), existing high resolution models in the area including estuaries (d: Regional CALVAL) link between the local and global cal/val methods, successfully applied for Jason-2, Envisat and SARAL/AltiKa at Bass Strait, Corsica and Harvest locations. (e: Lake Issyk-kul) Permanent facility since 2004: weather stations, two permanent GPS stations and gauges, Lake with an area of ~6000 km² (all the past and current missions have over flown the lake), calibration experiments through cruise campaigns at overflight time, GNSS reflectometer near Cholpon Ata, 1 swath of SWOT will overfly the lake during the 1-day phase, 4 ground tracks (~6 swaths) during the 21-day phase. (f: Amazon basin) Large number of leveled gauges maintained and used for T/P, Jason, ERS/Envisat SARAL/AltiKa and Sentinel 3A, location of the in-situ equipments dedicated to the CAL/VAL activity along the Amazon River: dots stands for gauges, with the same color code as for the missions, namely red for Sentinel‑3A, blue for Sentinel‑3B, yellow for ERS-Envisat-SARAL/AltiKa and purple for TOPEX/Poseidon and Jason‑1&2, squares stand for the places with permanent GPS and weather stations, other places are just leveled with GPS. GNSS buoys have experienced many different developments since its first use in 1994 to use Harvest (Born et al., 1994) after the launch of TOPEX / Poseidon. The latest creations (Watson et al 2011; Testut et al 2010) raise the antenna height above the water level while minimizing the inclination to avoid losing the GNSS signal caused by the waves. This design allows a very precise definition of antenna heights, but does not allow smooth movement to cover large areas. On the other side, using boats (Lake Issykkul or Vanuatu for example) it is possible to cover large areas, but with the difficulty of estimating the height of the antenna because of speed dependency, fuel consumption or other factors (Bouin et al, 2009, b;. Crétaux et al, 2011 & 2013). The INSU Technical Division (DT INSU) explored at our request, another approach to building a mobile GNSS to map the surface of the sea that can be towed at high speed. So the basic idea is to force the antenna reference point to be on the surface of the sea, by putting a GNSS antenna on a floating sheet (CalNaGeo, Figure 3). It was tested in 2015 on the Corsica site and the results show a very good stability of the waterline whatever the speed: better than 3 mm/(m/s) over the range 0-6 m/s and almost zero on range 0-4 m/s (Figure 4). Figure 3. GNSS-Zodiac in Corsica (left), CalNaGeo in Corsica (center) and radar coupled with a GNSS at Issyk-Kul (right). Figure 4. Differences of sea level between CalNaGeo and the tide gauge as a function of speed. The operation with ships as GNSS antenna support would be in this view much more efficient and practical. This would achieve the largest travel speeds and reduce the useful equipment. However, its use is relatively rare in precision measurement operations by GNSS, as the boats generally have low stability. They are actually subjected to important rolling and pitching and especially have the unfortunate characteristic of lift off beyond a certain speed. All these parameters greatly affect the previously determined position of the GNSS antenna above the water level, and therefore affect the final accuracy of the results. Many studies (Zilkowsky et al, 1997, Clarke et al, 2005, etc ...), were conducted by calibrating precisely the attitude of a boat according to different parameters (speed, curve, sea conditions, boat load, etc ...) allowing to know precisely the position of the GNSS antenna above the water. These calibrations are particularly long, complex, expensive, and not always possible to obtain an accuracy of one centimeter. Then, the idea of measuring in real time, simultaneously with GNSS measurements, the position of the antenna above the sea level is particularly interesting: it would allow to overcome a calibration attitude of the boat, attempting to obtain centimeter accuracy, and thus to simplify the observation campaign by making direct and simple use of a boat. A first experiment was conducted in July 2014 on Lake Issyk-Kul (Figure 3) which showed very good results in a very quiet area. The idea of development required here is to couple the system to a gimbal and inclinometers to compensate and measure the roll and pitch effects of the boat. The GNSS antenna height relative to the sea is the measured by a radar synchronized to the GNSS time. A better characterization of the errors. A preprocessing algorithm dedicated to typical oceanic conditions. The implementation of new processing capabilities, alternative parameterization and more efficient algorithms. The two main techniques are conventional GNSS-R, or cGNSS-R, which is based on the use of dedicated bi-antennas receivers, and the Interference Pattern Technique, or IPT, which is based on the use of standard mono-antenna receivers such as those used in geodetic networks. The Geodesy from Space team at CNES/GET has developed an expertise in the inversion of GNSS signals for environmental applications of reflectometry, especially for the monitoring of sea level and state in coastal areas using both cGNSS-R (Lestarquit et al., in press) and IPT (Roussel et al., 2015). Our goal is to demonstrate that GNSS-R measurements can be used as a promising complementary data source for the validation of altimetry measurements over ocean in coastal areas and rivers, including the next SWOT mission. In particular, research on SSH and SSB estimates along the Pertuis, Île d'Aix and Gironde estuaries will benefit from methodological improvements and independent observations of the GNSS-R technique. Our study area is located in the French Atlantic coast between La Rochelle and the Spanish border (Figure 2). Due to the non-colocation of in situ and remote observations, altimetry calibration requires to complete the water surface dynamics gap between satellite observation and in situ measurements in order to remove the subsequent uncertainties or misfits. A major difficulty is the land-based implementation of in situ gauges, where short-scale dynamics impact the local observations. Beside this challenge, the existing and forth-coming altimetry missions are now requesting to upgrade the calibration methodology toward spatially-extended capabilities. For example, calibrating and validating SWOT measurements implies to significantly increase the resolution of the local geoids but also the covered area to be able to resolve signals at wavelengths from 15 km up to 100 km. The planned extension (Figure 2a) consists of a set of lines in the satellite across-track direction with a ~1 km spacing and with a width from ~20 km up to 50 km (full right swath) due to the coast configuration. The length in the along-track direction is from ~24 km up to 70 km. Four perpendicular lines (along-track) will be also measured to perform crossover analysis and constrain the final gridding. The total distance is ~2500 km and it will be measured using the CalNaGeo system (Figure 3). In the ocean domain, the hydrodynamic modeling of the (high frequency) ocean sea surface variations has been implemented to connect off-shore observations with in situ measurements. Our approach is to push this methodology toward very high accuracy and precision, not only by increasing model resolution but also by considering ocean waves and circulation effects. T UGOm simulations of tides and storm surges will cover the 1992-2019 period to provide improved high frequency corrections in the coastal altimetry data processing and connection with in situ measurements. It will be imbricated in the LEGOS global storm surge configuration and tidal boundary conditions will be extracted from the FES2014 atlas or from direct satellite altimetry analysis. Atmospheric forcing will be taken from the ECMWF re-analysis products at the best time/space resolution. Sensitivity to the meteorological forcing formulation (i.e. bulk formula against wind stress deduced from the ocean wave model) will be examined. A high resolution and precise bathymetry has been built with special care taken for the regions surrounding the tide gauge location in order to guarantee a proper dynamical connection between the satellite data and in situ data, especially when resolving ocean waves setup at shorelines. WW3 model will be run to infer ocean waves impact on sea level during strong waves event at calibration sites. In littoral domain, we will combine high resolution fully-coupled wave and circulation models (SCHISM modelling platform) already implemented over the Pertuis Charentais area (Bertin et al., 2014; Bertin et al., 2015) with field measurements of waves, water level and currents. Although these existing models underwent large progresses over the last 5 years, many improvements still need to be performed in order to reproduce accurately strongly distorted tides, storm surges and wave fields. Among the expected developments, we will work on wave-current interactions in 3D, the representation of the dissipation of waves induced by counter currents and the parameterizations of surface and bottom stresses. Additional field measurements (waves, currents, water levels) will be carried out in areas with strong bathymetric and/or current gradients, possibly under storm waves. In the lake domain, we will use the infrastructure and instrumentation already deployed around the Lake Issyk-Kul in Central Asia. It includes a local network of weather stations, lake level gauges. Moreover, within the framework of the FOAM project, two GPS permanent stations, one radar to measure high frequency water level of the lake and another weather station were deployed last ten years. These sites have been used over the last 15 years for the Calibration/Validation of the past and present nadir altimeters. A specific methodology has been developed and refined over the Lake Issyk-Kul. We carry a GNNS receiver coupled with a radar on a boat allowing to correct for instantaneous motions, and measure vertical gradient of the lake's surface due to the gravity (Figure 3). To do so, we use the GINS software in PPP mode which provides centimeter accuracy in kinematic mode. For SWOT we will use the historical data of about 20 field campaigns (starting in 2004) allowing mapping the lake surface in order to compare and calibrate the SWOT data. During the fast sampling phase which will have a full swath covering the lake, we will perform a two to three months field work with in situ instantaneous mapping of the lake height directly compared to the SWOT 's one day data. New instrumentation (GPS permanent receiver, radar and weather stations) will still be deployed until the launch of the satellite. In the river domain, we will use two distinct methodologies, internal comparison (differences between tracks forming a crossover over a reach) and external comparison (differences with gauge readings, either gauges maintained by the team right at orbit ground tracks, or gauges in the vicinity of the track but taking into account for the spatial and temporal slopes of the free surface). All this work has also to be considered in the preparation of SWOT. Using the SWOT data will require that the SWOT measurements are consistent with predecessors' measurements. The cal/val activity conducted in this project, unique of this size and kind in the world, is mandatory to be able to associate the SWOT data with predecessors' data, as it is to put altogether the data of the current mission. In the framework of Benoit Laignel SWOT Investigation Plan, we have performed a field experiment by measuring the water heights of the Seine River using the CalNaGeo system. These measurements will be used to compare with in situ measurements (tide gauges) and to validate the high-resolution hydrological model based on T UGOm. Bertin, X., Li, K. and Roland et Bidlot, J.R., (2015). The contribution of short waves in storm surges: two recent examples in the central part of the Bay of Biscay. Continental Shelf Research 96, 1-15. Bertin, X., Li, K., Roland, A., Breilh, J.F., Zhang, Y.L. and Chaumillon, E., (2014). A modeling-based analysis of the flooding associated with Xynthia, central Bay of Biscay. Coastal Engineering 94, 80-89. Bonnefond, P., B. Haines and C. Watson (2011). In Situ Calibration and Validation: A Link from Coastal to Open‐ocean altimetry, chapter in Coastal Altimetry, edited by S. Vignudelli, A. Kostianoy, P. Cipollini, J. Benveniste, Springer, ISBN: 978-3-642-12795-3. Bonnefond, P., P. Exertier, O. Laurain, Y. Menard, A. Orsoni, E. Jeansou, B. Haines, D. Kubitschek, and G. Born (2003) Leveling Sea Surface using a GPS catamaran, Special Issue on Jason-1 Calibration/Validation, Part 1, Mar. Geod., Vol. 26, No. 3-4, 319-334. Bouin M.N., V. Ballu, S. Calmant and B. Pelletier (2009). Improving resolution and accuracy of Mean Sea Surface from kinematic GPS, Vanuatu Subduction Zone. J. Geod. doi: 10.1007/S00190-009-0320-7. Clarke J.E.H., Dare, P., Beaudoin J., and Bartlett, J., (2005). 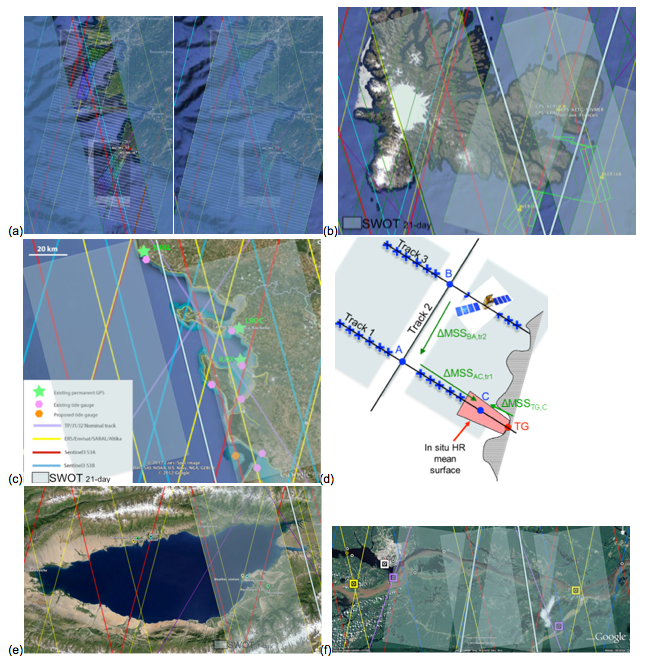 A stable vertical reference for bathymetric surveying and tidal analysis in the high Arctic, U.S. Hydrographic Conference.Crétaux J-F, Calmant S, Romanovski V, Perosanz F, Tashbaeva S, Bonnefond P, Moreira D, Shum C.K, Nino F, Bergé-Nguyen M, Fleury S, Gegout P, Abarca Del Rio R, and Maisongrande P (2011). Absolute Calibration of Jason radar altimeters from GPS kinematic campaigns over Lake Issykkul, Marine Geodesy 34: 3-4,291-318. Crétaux J-F., Bergé-Nguyen M., Calmant S., Romanovski V.V., Meyssignac B., Perosanz F., Tashbaeva, S., Arsen A., Fund F., Martignago N., Bonnefond P., Laurain O., Morrow R., Maisongrande P. (2013). Calibration of Envisat radar altimeter over the Lake Issykkul, Advances in Space Research, Volume 51, Issue 8, Pages 1523-1541, ISSN 0273-1177, 10.1016/j.asr.2012.06.039. Haines, B.J., D. Dong, G.H. Born and S.K. Gill (2003). The Harvest experiment: Monitoring Jason 1 and TOPEX/POSEIDON from a California offshore platform, Special Issue on Jason 1 Calibration/Validation, Part 1, Mar. Geod., Vol. 26, No. 3-4, 239-259. Lestarquit L., Peyrezabes M., Darrozes J., Motte E., Roussel N., Wautelet G., Frappart F., Ramillien G., Biancale R., Zribi M. (2016). Reflectometry with an open-source Software GNSS Receiver. Use Cases with Carrier Phase Altimetry, IEEE Journal of Selected Topics in Applied Earth Observations and Remote Sensing, 9(10), 4843-4853, doi: 10.1109/JSTARS.2016.2568742. Roussel N., Ramillien G., Frappart F., Darrozes J., Gay A., Striebig N., Biancale R., Hanquiez V., Allain D. (2015). Sea level monitoring and sea state estimate using a single geodetic receiver. Remote Sensing of Environment, 171, 261-277, doi:10.1016/j.rse.2015.10.011. Zilkoski D.B., D'Onofrio J.D., Fury R.J., Smith C.L., Huff L.C. and Gallagher B.J., (1997). The U. S. Coast Guard Buoy Tender Test, Report on the Joint Coast Survey and National Geodetic Survey Centimeter-Level Positioning of a Marine Vessel Project.